It’s all well and good finding the latest modern designer radiator in a contemporary textured finish that suits your room just right. But what about performance? After all, radiators have to be practical. Here at Geyser, we strive to bring you innovative radiator designs coupled with excellent, economical outputs. One without the other simply doesn’t cut it. When renovating a modern home, the decisions are endless. Finding furniture and accessories to complement your taste and interior can be hard, but we’ve made finding your ideal radiator easy. With that in mind, we’ve made sure that regardless of your individual style, the radiator you choose will heat your space efficiently. This has been achieved by committing to more and more aluminium radiator designs, such as the Torpedo and the Aero. First of all, aluminium is a highly conductive metal. This means that it will heat up very quickly and produce high heat outputs, a great solution for those problematic cold rooms. This also means that it doesn’t need as much water compared to other materials. The cycle of water is much smaller because heat will move more quickly through the surface and in to the room. This drastically reduces heating bills and is much kinder to your boiler. 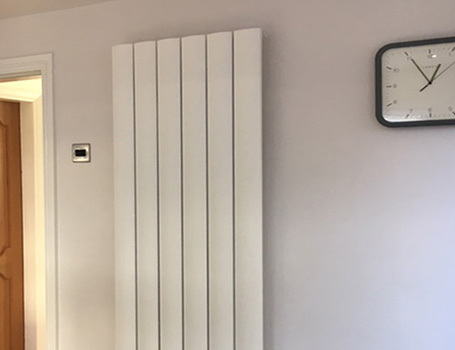 As a result, an aluminium radiator can be smaller, slender, sleeker and blend in to your room seamlessly whilst still producing the same heat output as a bulkier, heavier mild steel radiator. Another benefit is that aluminium resists corrosion better than other materials. As a result, they will outlast other materials by far, increasing the longevity of your radiator. By extension, aluminium won’t create a build-up of rotting iron in your system, which is unavoidable over time with steel radiators. Your system will need much less maintenance. A more efficient, economical and longer lasting product gives three big wins for the environment. This is becoming more and more important as people begin to view the environmental impact of the things that they buy as a bigger concern. Not only is an aluminium radiator light on your conscience, it is also light on your wall. Aluminium is a very lightweight material, making it easier to handle and install on weaker walls where a heavier radiator couldn’t go. Previously, you might have necessarily compromised on where you put a radiator. The perfect place for it in your space, where it will blend in or make use of unused wall space, might not have had a suitably strong wall. This problem is a thing of a past now – your room design can be entirely led by your unique style.